These Peppermint Meringue Cookies are such a pretty, delicate addition to a Christmas cookie platter. The light, airy texture and bright mint flavor are a wonderful contrast to other rich holiday treats. Like the pastel-colored, vanilla Easy Meringue Cookies that I make around Easter, they’re gluten-free so everyone can enjoy them. This is not a recipe to make by hand — you’ll want a stand-mixer or, at the very least, an electric beater with a whisk attachment. Oh, sure, you could try it the old-fashioned, manual way but your arm will be too tired to lift afterward. So, go ahead and haul that big mixer out of the back of the kitchen cabinet before you get started. Then, read on for some tips that will save you loads of frustration. 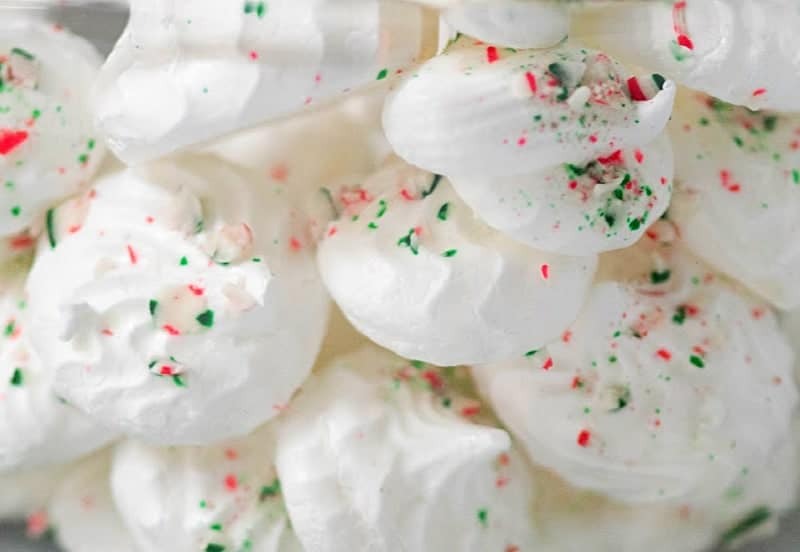 Whether you’re making these Peppermint Meringue Cookies or a meringue topping for a pie, there are some essential steps that you must take to ensure success. Degrease your equipment: Grease keeps egg whites from reaching stiff peak consistency. So, before you begin, get a cloth damp with white vinegar then wipe the bowl and whisk to remove grease and let them air dry. Carefully separate your eggs: Even a tiny trace of yolk in the egg whites will ruin the recipe. If you’re not great at separating egg yolks and whites, go ahead and buy a carton of pasteurized egg whites to use. 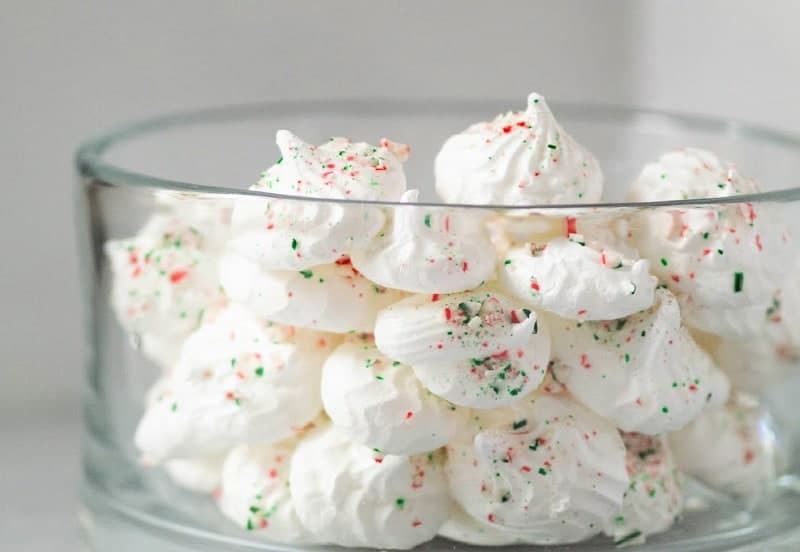 Don’t rush things: As the Peppermint Meringue Cookies recipe indicates, you need to use room temperature egg whites, so let them sit on a counter for 30 minutes before you start. If you’re in a hurry, you can pour the egg whites into a small bowl and set that into a larger bowl of warm (not hot) water for 5 minutes. Know what stiff peaks look like: Don’t rush the whisking, either. You must reach the stiff-peak stage, or your meringues will collapse in the oven. It can take 5 minutes to reach the soft peak stage, and another 5 to form stiff peaks. 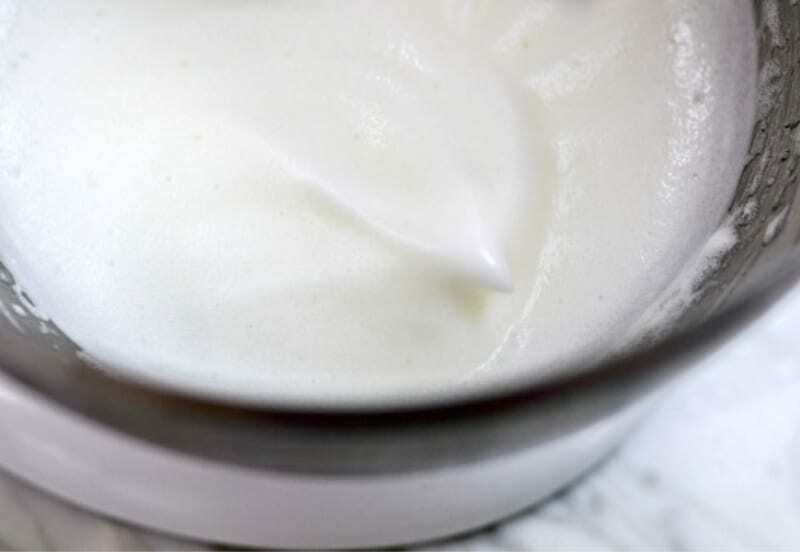 Soft peaks will fold and collapse on themselves when you lift the whisk out of the mixture. Stiff peaks will remain upright. Here’s what that looks like. Now, don’t let those tips intimidate you. 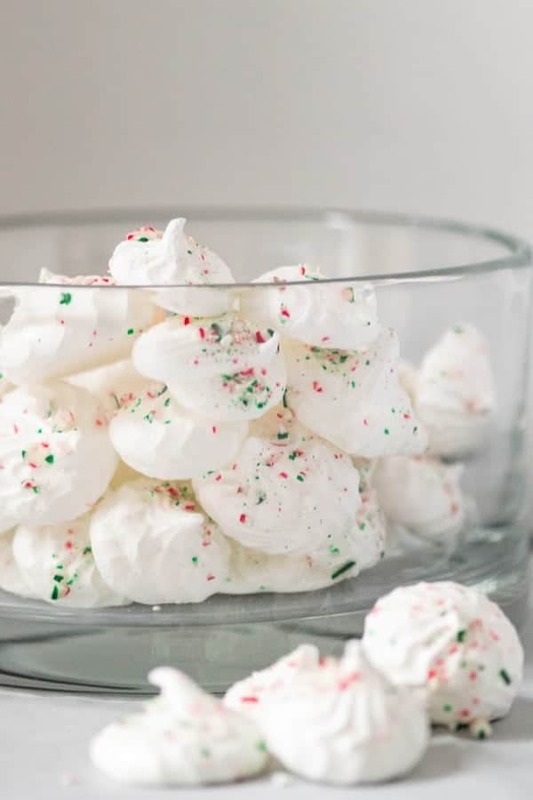 Peppermint Meringue Cookies are pretty simple to make — just be patient! Don’t like peppermint? Use vanilla extract instead or even lemon. You can swap sprinkles or colored sugar for the crushed candy canes if you’d rather, or leave them bare. Don’t like bright white cookies? Stir in 1/4 teaspoon of food coloring with your extract. The point is, they’re a lot less fussy than you might think. 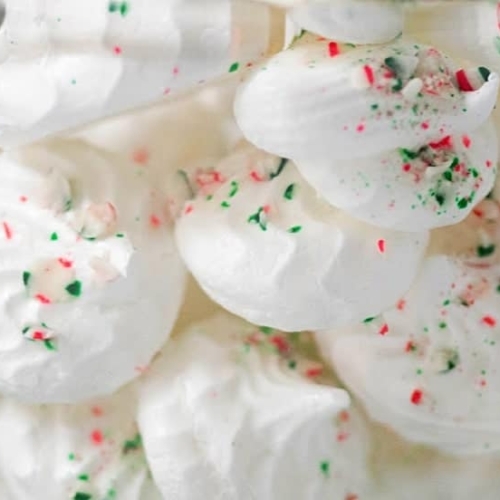 Peppermint Meringue Cookies can last for days in an air-tight container away from humidity. If you want to freeze them, place a sheet of parchment paper between each layer as you stack them. To defrost, remove them from the container and place them on the counter for an hour before serving. The important thing is to keep them away from humidity because these fluffy little bites of sweetness will soak up any moisture in the air. 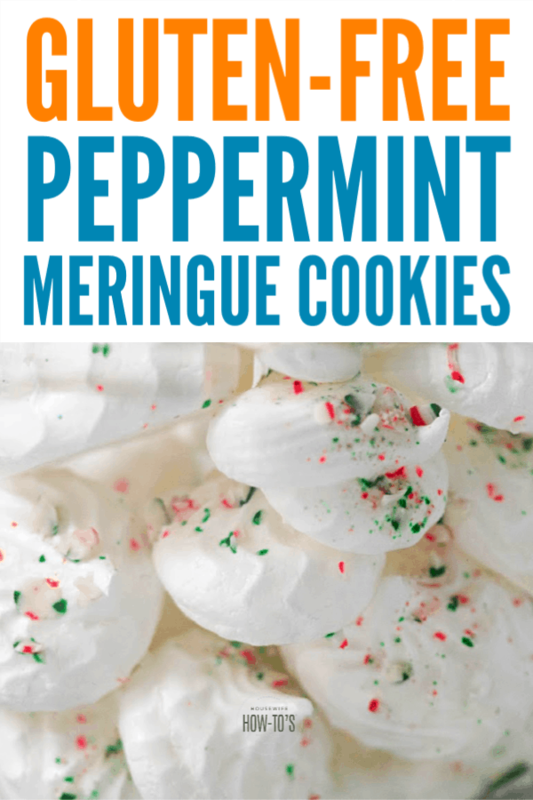 Light and airy Peppermint Meringue Cookies are a wonderful addition to your holiday dessert lineup. They're naturally gluten-free, too! Preheat oven to 225°F/107°C. Line two baking sheets with parchment paper. Wipe a large mixing bowl and whisk with a towel lightly dampened in white vinegar to ensure they're completely grease free. Let these air dry. Add egg whites to the clean, dry bowl and whisk on medium speed until frothy. Add peppermint extract and beat for 10 more seconds. Plop by spoonful onto the baking trays or pipe quarter-sized cookies using an icing bag and a star tip about 1 inch apart. Sprinkle with crushed candy canes. Bake both sheets at the same time for 90 minutes then turn the oven off. Do NOT open the oven door. Let the meringue cookies stay in the oven for at least one hour, up to overnight, until completely cooled. Store in an air-tight container for up to 2 weeks. To freeze, place sheets of parchment paper between layers of cookies. Defrost layers separately on the counter for one hour before serving.